Sometimes, the match doesn't make any sense yet it works out in the end. There were a lot of odd story lines and factoids coming into the match between the Portland Timbers and Columbus Crew, but nobody could have fully prepared for the oddities that would occur in this match. Between a delayed start time, a rocky starting 15 minutes, redemption in the first half, a furious start to the second half, a frenetic finish with odd officiating and interesting substitutions, the intrigue was very high for this midweek match. 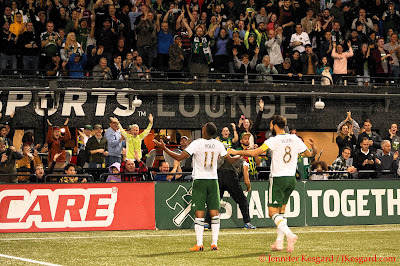 We've seen Portland struggle under conditions and situations like this before, but on this night, the Timbers pulled together and held on for a dramatic 3 to 2 win over the Crew. The result did alleviate some of the concerns put on display after the Houston Dynamo outran the Timbers over the previous weekend by a 4 to 1 score, but Portland now needs to regroup quickly for their last lengthy road trip of the 2018 regular season when they face Minnesota United FC on September 22nd in the Twin Cities. The soccer wasn't pretty at points and was one of the most emotionally draining matches I've witnessed in some time, but this club gutted through it and got an important result at home to restore some confidence. 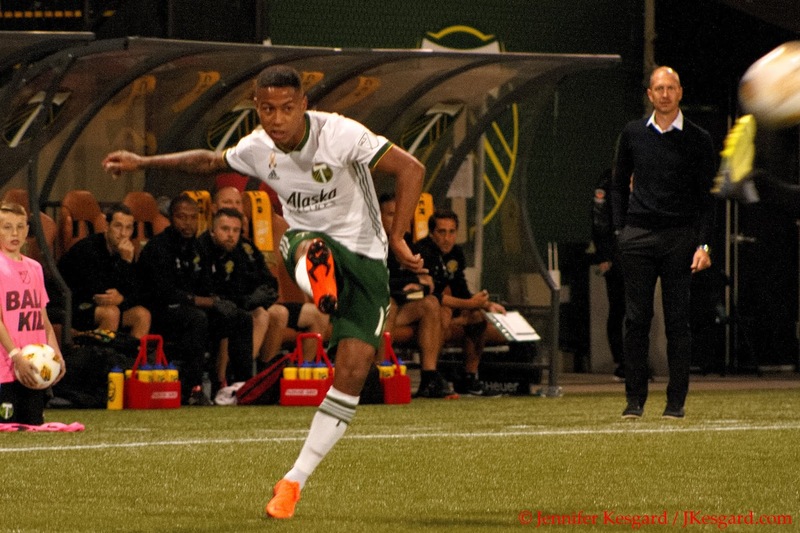 Timbers Coach Gio Savarese was less than pleased with the Timbers' effort in Houston despite the team taking an early lead off an own goal caused from a shot by Alvas Powell. Portland thought they had tied the match at 2 just before the half, but upon VAR review, the leveling effort from Diego Chara off a Diego Valeri assist was ruled no goal as Valeri was offside. Replays show if this truly was the case, it was off by mere millimeters, but the negated goal doesn't explain the struggles in the second half when Portland failed to generate any consistent offense as Houston employed their counter to tack on 2 more goals to win going away. To that end, Savarese made several updates within the starting eleven against a Crew side that has some of the same qualities as Houston in terms of playing the counter to hopefully stabilize the side. 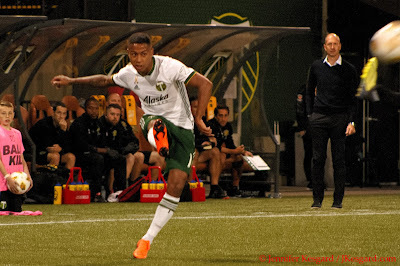 Steve Clark was again in goal for the Timbers with Kendall McIntosh listed as his substitute, while Savarese brought back Liam Ridgewell to pair with Larrys Mabiala as the center back duo with Julio Cascante listed on the bench. Powell, who was one of the few bright spots early in Houston, was also sent to the bench for Jorge Villafana as Zarek Valentin was flanked out right. 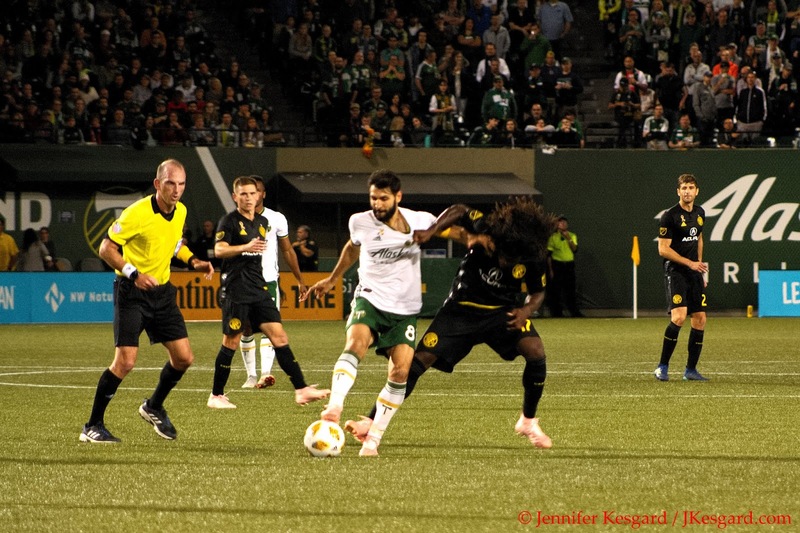 Lawrence Olum, who had started in the last 2 matches for the Timbers, was given the night off in the midfield and replaced directly with David Guzman alongside Chara and Andy Polo, who started in place of Cristhian Paredes. Even the offensive trio got an adjustment as Samuel Armenteros was selected to start in lieu of Jeremy Ebobisse at striker with Valeri and Sebastian Blanco employed as the attacking midfield. Savarese did have Lucas Melano, Andres Flores and Bill Tuiloma also available as needed, but the real keys here were if the changes to add Guzman, Ridgewell, Polo, Villafana and Armenteros were enough to stabilize the offense. Sebastian Blanco was everywhere on this night. Literally. Columbus was dealing with their own match compression after playing at FC Dallas on September 15 then traveling to the Rose City before heading home to host Colorado on September 22, so Crew Coach Gregg Berhalter was dealing with his own squad rotation. Berhalter left several regulars out of the rotation or on bench duty for the Timbers, as Ricardo Clark, Jonathan Mensah, Frederico Higuain and Harrison Afful were left off the game day 18. Leading scorer Gyasi Zardes, a noted Timbers thorn from his days with the Los Angeles Galaxy, was relegated to the bench, leaving Berhalter to use veteran striker Patrick Mullins up top with Eduardo Sosa and Pedro Santos in support. Of the Crew's top scorers, Santos, Milton Valenzuela and Niko Hansen at fourth, fifth and sixth respectively were the leading scorers listed. In the middle of the formation, however, the Crew had solid vets in Will Trapp and Artur patrolling the middle and young goalkeeper Zack Steffen in the net. While the Timbers in the middle of a pileup in the West table, Columbus has settled into fourth place in the east behind Atlanta, the Red Bulls and NYCFC with Philly and Montreal just behind. While getting points here would be huge in keeping them entrenched in the East, the Crew had a bit more flexibility here in their lineup choices while still doing all they could to keep their spot in the table. With all the intriguing story lines coming into the match with squad rotation, another piece that would end up being discussed at length was the officiating. Ted Unkel is one of the most senior officials within MLS in terms of game experience, however, Unkel's style of officiating can be best described as a mix between heavy handed calls and complete laissez-faire monitoring. That was probably made extremely apparent in the 7th minute when the Crew were breaking down the middle with a pass for Mullins and the Crew striker caught Guzman with an elbow to the face. With Guzman down, Unkel didn't make any call as the Timbers protested and the Crew pressed when Sosa fed Santos with a pass on the left that was dropped to Valenzuela on the flank. A low cross back to the box nearly caught up to Mullins, but he dummied the ball to keep the Timbers flat footed and Hanson broke in behind to shoot the ball into the goal. Villafana might have helped the ball in with some contact, but with the Timbers extremely frustrated, the Crew had taken the early 1 to 0 lead. Two minutes later, Sosa went down easily on a run to the left that earned Polo a caution, and Guzman was yelling at Unkel for the missed call earlier in the match. Ted Unkel either called everything or nothing. Was that kind of match. The situation could have gotten much worse if not for the defense of Clark in the 12th minute when Santos fed Mullins in the left channel and the Timbers defense was caught completely off their marks. Mullins was onside with the back line and tried to pull the ball inside the right post with his shot, but only a finger tip push from Clark kept the ball from hitting the intended target. At this point, Portland was lucky enough to not be down by 2 goals and the team was visibly frustrated at the situation presented to them. The Crew were having their way in the midfield early, and with Unkel's approach to foul calls, Portland would have to come up with a strategy to recover from the early match doldrums or run the risk of being run out of their own building. Blanco indeed registered the first shot on goal in the 14th minute and Polo added a close miss 2 minutes later off a big give and go, but the Timbers would finally break out of the funk courtesy of their defensive midfielder. In the 18th minute, Chara played a ball to Blanco, who was equally sharing distribution duties with Valeri, and Seba put a diagonal ball out to Polo on the right. The young winger put a cross to the top of the box where Guzman was waiting in space as Crew defenders Gaston Sauro and Hector Jimenez were slow to pick him up. David put an expertly placed header inside the left post off the cross, and the sense of relief felt by the Timbers and the crowd seemed to energize everybody. 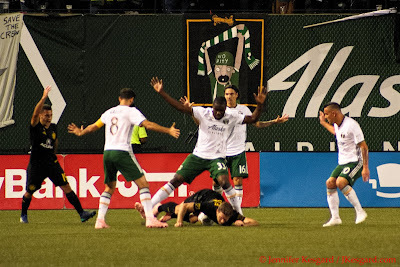 Guzman was still upset about the earlier play, and he earned a caution off a hard foul in the 34th minute that appeared to be somewhat retaliatory, but you also got the sense that the Timbers were ready to fight. They had to deal with immediate threats from consecutive free kicks by the Crew with Santos going at goal near the box, and Clark made an especially tricky save in the 26th minute off the best effort. Valenzuela, Santos and Artur also challenged the Timbers defense within the next few minutes, but the Timbers would end up taking the lead in the 37th minute off one of the best individual plays I've seen from a Timbers player in some time. Andy Polo celebrates his goal. One of the best individual efforts I've seen. 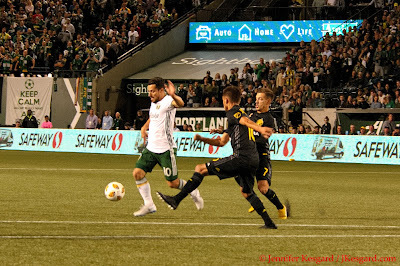 In the 37th minute, Polo started in the North End by heading a ball away from Hanson and Jimenez lurking in the Timbers box, but he then picked up the ball and made a box to box sprint that left Jimenez in the dust with Blanco and Valeri running in support. Polo put the ball in the middle past Valeri for Blanco, and Seba put the cross back to Polo on the right for a headed shot on frame with Steffen fully charging off his line. The shot hit Valenzuela and started to head away from goal but stayed in play as Polo kept his run going to then jump up and poke the ball towards goal with his left foot. 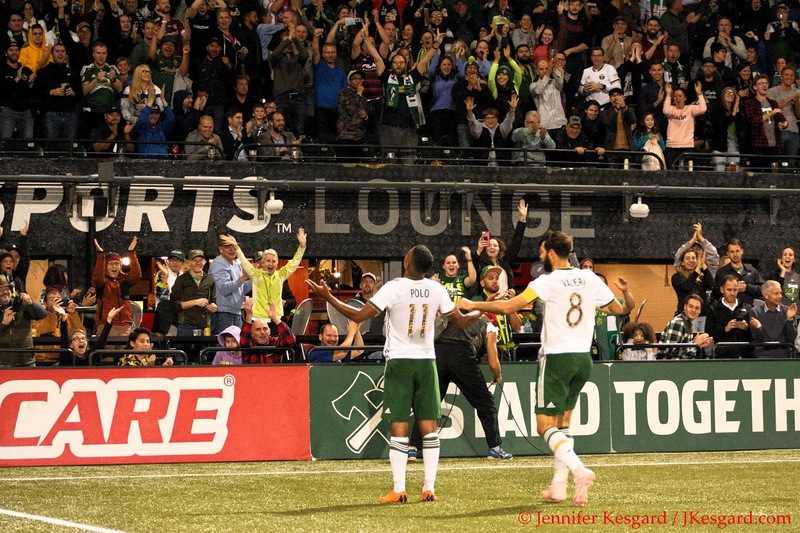 Valenzuela could do nothing and while Trapp did get to the ball to punch it skyward with his boot, it had passed the goal line to score Polo's first ever MLS goal for the Timbers' first team. While Polo was ahead of the shot when it hit Valenzuela, the offside flag would not be applied because the ball struck a Crew player first and so Polo could attack the ball without fear of being flagged. The celebration was epic as the young winger was surrounded by his teammates, and within 30 minutes, Polo had racked up an unusual hat trick of a goal, an assist and a caution card. The half ended minutes later without anything else happening, but admittedly, the home side was still buzzing about Polo's huge individual effort. The second half saw no changes to either side, but the Timbers kept up the pressure and added to their lead before most fans had settled back into their seats. Valeri led a break in the 48th minute up the middle and fed a streaking Chara on the left side with a pass, but his shot was blocked by Sauro over to the right where Armenteros ran down the loose ball. The striker took a simple move, shot the ball and it banked off Crew defender Lalas Abubakar past Steffen to push the lead to 3 to 1. Unlike the Villafana/Hanson situation where it appeared that Hanson got the shot and it hit off Villafana in the action, this one was originally given to Armenteros but later changed to an own goal as Abubakar's action pushed the ball into the net. The Timbers spent the next 10 minutes or so circling about with a myriad of shots and chances, but they couldn't add anything to their tally before the Crew executed the soccer equivalent of a hockey line change - Berhalter used all 3 of his subs at the same time in the 61st minute when he brought on Josh Williams, Conor Maloney and Luis Argudo for Santos, Valenzuela and Artur. With this move, Berhalter left his big offensive guns on the bench with Meram and Zardes getting the night off, but would it be the right move? Everyone put your hands up. Everyone! Meanwhile, the tempers were still simmering at Unkel, who by this point had carded Sauro for a slide tackle right after the 2nd half whistle on Armenteros when he had already leveled Valeri and Blanco previously with worse actions, and Trapp had a hard foul in the 49th minute and argued the call, but Unkel wasn't having any of it. The Timbers, who had been initially frustrated by the calls, seemed to be adjusting better now that the scrutiny of the officiating had turned on the visitors. But outside of a pulled shot from Mullins in the 65th minute and a rushed effort from Hansen in the 77th minute, it looked like the Crew might have run out of ideas until they put a late rush on goal in stoppage time. One of the more curious moves in the match was the fact that Savarese chose to leave the starters on the pitch until Ebobisse replaced Armenteros in the 84th minute and Valeri was subbed by Melano right as the stoppage time started. The Crew were pressing a lot to see if they could make things interesting, but the Timbers defense had been reasonably solid in denying the chances until the late stages. After Mullins pulled a shot wide of the left post and Williams pulled a shot over the bar right afterwards on the next run. the Crew added a goal in the very late stages past the allocated 2 minutes of stoppage time. Sosa played a ball out wide right for Maloney who whipped a cross to the left post where Hansen had found space and no mark, and he confidently put the header past Clark as the Timbers Army were celebrating the win by Tetrising. The final whistle blew right after the restart, but it was some very nervy late moments as the Crew pulled out an extra goal to make things interesting. The biggest questions now surround the trip to Minnesota this weekend with really most of the key offensive threats for the Timbers having played big minutes in Houston and versus Columbus. Does Ebobisse get the start against the Loons since Armenteros played most of the match? Does Savarese avoid the rotation on defense and play Ridgewell and Villafana again for long minutes after the midweek match or does he go back to Cascante and Powell instead? Usually a big win like this adds some confidence for the victors, but with the Timbers staring at a wickedly hard schedule down the stretch, player health and fitness will be paramount. This point is huge considering that after Minnesota, the Timbers play 4 matches against teams in the playoff chase around them (host FC Dallas on 9/29 currently in 2nd place; RSL in Utah on 10/7 currently in 5th place behind Portland, RSL in Portland on 10/21, Vancouver in Canada on 10/28 with the Caps currently in 7th place 4 points below the line).